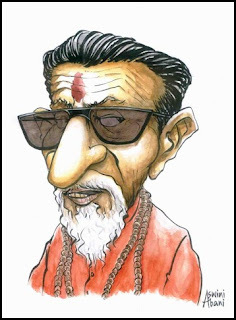 The declaration of demise of Bal Thackeray (November 17, 2012) has brought the Mumbai city to a complete halt. Most of the news channels are relaying his death procession round the clock and having discussion about his tall stature most of the time. His grip on the city had been more or less complete from last three decades in particular. The methods he employed had some supporters on one side but for others it filled the people with fear, as his followers had been openly indulging in acts of vandalism time and over again. Today it is very difficult to say that city has come to a halt merely out of reverence for him alone or fear factor is also there behind this closure of the city will have to be assessed over a period of time. As per some accounts Thackeray family had migrated from Bihar and finally settled in Maharashtra. Bal Thackeray came to prominence for voicing the need for jobs for ‘sons of the soil’ and with open threats to South Indians, Gujarathis, Biharis in that order. His initial role was that of breaking the left controlled trade unions, at the behest of the industrialists and section of the ruling party, Congress. This action of his had led to lot of violence between the leftist trade unions and Thackeray followers. The peak of this was murder of the CPI trade Unionist Krishna Desai, a blow from which the left trade unions could not recover. He later jumped to bandwagon of Hidnutva politics, openly supporting the Bari demolition and playing an active part in the horrific Mumbai violence of 92-93. His writings in Saamna, the Shiv Sena mouth piece, were very provocative and could easily come under the clause of ‘Hate Speech’ but despite that the case filed by some Mumbai citizens fell through and Thackeray continued to spread his anti Muslim tirade through his speeches and writings. True later Election Commission disenfranchised him for six years from voting. After Babri demolition, someone suggested that the Shiv Sainiks were the one who demolished it; he cleverly lapped it up and said that if Shiv Sainiks have done it I am proud of that. “These Celebrations by Shiv Sena had mobs which were chanting provocative slogans: Musalman Ka Do Hi Sthan: Pakistan Ya Kabristhan (Muslims can only be in: Pakistan or Graveyard). In retaliation Muslims shout: Jo ham se takarayega: Mitti me mil Jayega (Those who attack us will be decimated). This is just a small sample of what was the role of Thackeray and his Shiv Sena in The Mumbai violence. After the Mumbai violence he started being called Hindu Hriday Samrat and had a total grip on the politics of Shiv Sena. He was unfazed by the impact of his beliefs and actions. In his famous interview to the time magazine (titled: Kick them out!) during this time he poured vitriol on the Muslims with all abuses and hate. As Muslims were fleeing Mumbai he said that Muslims need to be taught a lesson. If they are fleeing Mumbai, it’s OK; else they should be kicked out. He has been an opponent of Indo-Pak friendship all through. Be it the question of Indo Pak Cricket match or the concert of Pakistani Gazal singers, Mumbai witnessed the ‘direct action’ of Shiv Sainkis in the form of digging the cricket ground pitch at Kotla cricket ground or vandalizing the Gazal concert in Mumbai. Much before the coming to fore of the terror of groups related to Sadhvi Prgya Singh Thakur or Swami Aseemanand, it was Thackeray who had called for the formation of ‘suicide squads’ by Hindus. A self avowed admirer of Hitler, he conceded that he appreciates Hitler and that he himself has many traits similar to Hitler. He believed in Thokshahi (Dictatorship) not Lokshahi (democracy). The divisive politics of Hidutva or the identity politics built around ‘sons of the soil’ does run parallel to his opposition to the affirmative action and aspirations of deprived sections of society. True to that he opposed the implementation of Mandal Commission, indicating his anti OBC politics. He was the only one who stated it openly. The other party thoroughly opposed to Mandal, BJP, which is opposed to affirmative action for any weaker section of society, dodged the issue and intensified on Ram Temple issue to bypass this affirmative action for OBCs. Similarly Thackeray has been vehement opponent of dalit aspirations in any form. When the Maharashtra Government published Babasaheb Ambedkar’s book, ‘Riddles of Rama and Krishna’, Shiv Sena stood to oppose it in a serious way and there was some violence between Shiv Sena supporters and dalits. When the issue of changing the name of Marathwada University to Ambedkar’s name came, Thackeray opposed it strongly leading to another bout of unrest. It is just a tragedy of our times that despite this clear agenda of Thackeray, some dalit parties are allying with his party at electoral level. The massive turnout as his funeral is being read as that he was the voice of Marathi manoos. True a section of Marathi people adore him, but the larger section of poor peasants, the workers and dalits from Maharashtra know that Thackeray has been no representative of their aspirations. With so many problems nagging the poor of Maharashtra there is a need to shift the terrain of politics away from identity politics of the likes of Thackeray to the material issues related to bread, butter, shelter and employment. The politics of Hindu nation and Marathi manoos is against the values of Indian Constitution which call for the principles of Liberty, Equality and Fraternity. How did Thackeray’s politics conform to these is a matter of introspection.